You are here: Home / decorating tips / New Year, New Challenge! January has always been a fun and busy month for Up to Date Interiors. Since my first year of blogging, I’ve created a month long “Love Your Space” challenge for the beginning of the year. It really hits home what my slogan is all about. This year’s challenge is to be inspired to have beautiful decorated shelves and tabletops. Follow along instagram, twitter, or facebook for a daily inspiration pic and decorating tip the entire month of January! P.S. I’m always looking for inspiration too and would love to see your beautifully styled flat surfaces. Just use the hashtags #uptodateinteirors and #loveyourspacestylinginspiration! Friend, I’m so passionate about my blog’s philosophy that I created a free mini email course for subscribers that goes through my decorating process. 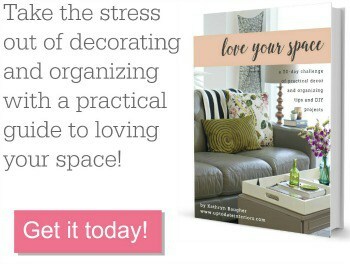 I also invested my best decorating and organizing tips and DIYs into Love Your Space ebook with free printable checklists. If you are ready to take on this challenge in Jan, use discount code happynewyear for 20% off during the entire month. The New Year is a fresh start for setting new goals for the way you live and I want one of them to be loving your home! I hope one of these challenges inspires you to make some changes in January. Other awesome things to do in January! Can’t wait to see those tips! You always have great style inspiration.